Experiments measuring corals’ responses to a variety of low pH conditions have shown a range of negative impacts, such as fewer varieties of corals, more algae growth, lower rates of calcium carbonate production (growth), and juvenile corals that have difficulty constructing skeletons. Researchers were perplexed, and when looking at other lower-pH reef systems the only common marker that was affected was an increase in bioerosion, which sounds kinda scary, but given the health of the reef, perhaps it reflects more turnover? The researchers point out that an increase in bioerosion is a “potential threat” to the survival of corals. But lets not forget that they are saying this as they report a real world example of higher bioerosion on a healthy reef with more species and more coral. What’s interesting to me is how surprised the researchers are when pH levels naturally vary around the worlds oceans, and sometimes by as much as 1.4 pH units in a single day at a single location. Ocean acidification is a natural, daily thing in some places, and marine life copes. It appears to cycle with the PDO. Moreso, we know that corals evolved in a world with a much higher CO2 level, and ice age swings mean temperatures and sea levels have also rapidly changed, yet corals survived. The natural pH of various Palau Reefs plotted against IPCC approved projections of future ocean pH. Barkey et al, 2015 | Fig. 1. Natural acidification gradient across Palau mirrors projected anthropogenic CO2-driven changes in ocean chemistry. Shown are the mean (±1 SD) dawn-to-dusk pH and War for our 11 reef study sites and diurnal pH variability at three of those sites over 4 days (inset) (fig. S1: sites 1, 2, and 10). Shaded regions indicate the range of western tropical Pacific open ocean pH and War levels in 2000 (blue) and open ocean values predicted for 2050 (orange) and 2100 (red) (12, 52). Colored points correspond to pH time series in inset. Figure 3. 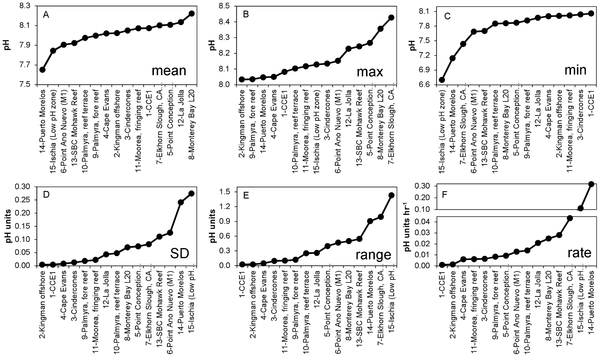 Metrics of short-term pH variability at 15 locations worldwide, ranked by ascending values. Mean = geometric mean; Max = maximum value recorded; Min = minimum value recorded; SD = standard deviation; Range = Max – Min; Rate = mean of the absolute rate of change between adjacent data points. Did the press office write this incorrect line (bolded), or did it come from the researchers? Since the beginning of the Industrial Revolution, ocean pH has fallen by 0.1 pH units, which represents an increase in acidity of approximately 30 percent. For marine life that has evolved over millions of years in relatively stable pH conditions, this kind of rapid change doesn’t allow for much time to adapt. By the end of this century, pH levels are projected to be nearly 150 percent more acidic, resulting in a pH that the oceans haven’t experienced for more than 20 million years. The use of the phrases “opposite of what we expected”, “none of the predicted responses” and “surprisingly” to describe the researchers suggests that neither Woods Hole or MIT are giving their oceanography students and staff adequate, comprehensive training. How much money is wasted because researchers don’t know the basics about the evolution and variability of the natural systems they study? The press release mentions a different study released earlier this year that suggests that “acidification” of the ocean will be a problem in sites suffering from high nutrient loads. In which case, we ought focus on real pollution (such as fertilizer run-off) rather than wasting time on an essential, natural, variable component of ecosystems, right? I’m all for that. Note, I’m not suggesting that changing average global ocean pH would have no effect, and would not change diversity at all — there may be some winners and losers – but the fear and hype associated with it is not supported by the evidence. A little bit of ocean acidification could possibly even be a good thing according to hundreds of studies. On this site Brice Bosnich described the basics on the chemistry of ocean acidification here: normal everyday pure rain is pH 5.7 and rivers are obviously more acidic than oceans will ever be. That there are freshwater species that survive under these conditions is not “proof” that extra CO2 is 100% safe, but when will our public paid “experts” start to give the public the whole truth, and not just carefully crafted hyperbole? As the ocean absorbs atmospheric carbon dioxide (CO2) released by the burning of fossil fuels, its chemistry is changing. The CO2 reacts with water molecules, lowering the ocean’s pH in a process known as ocean acidification. This process also removes carbonate ions, an essential ingredient needed by corals and other organisms to build their skeletons and shells. Will some corals be able to adapt to these rapidly changing conditions? If so, what will these coral reefs look like as the oceans become more acidic? In addition to laboratory experiments that simulate future ocean conditions, scientists are studying coral reefs in areas of the ocean where low pH is naturally occurring to try and answer important questions about ocean acidification, which threatens coral reef ecosystems worldwide. 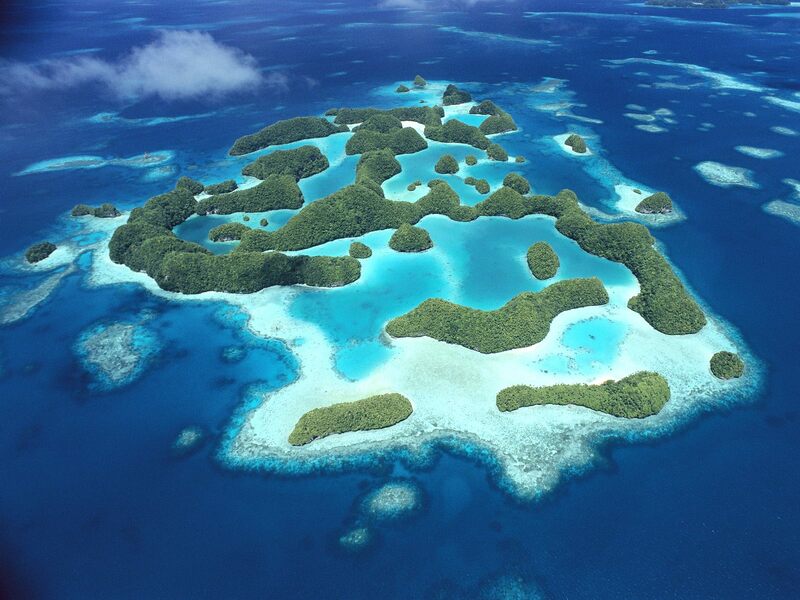 One such place is Palau, an archipelago in the far western Pacific Ocean. 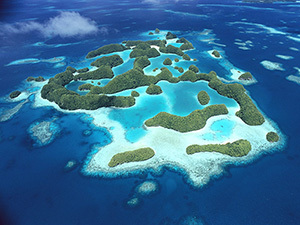 The tropical, turquoise waters of the Palau Rock Islands are naturally more acidic due to a combination of biological activity and the long residence time of seawater within its maze of lagoons and inlets. Seawater pH within the Rock Island lagoons is as low now as the open ocean is projected to be as a result of ocean acidification near the end of this century. When the research team compared the communities found on Palau’s reefs with those in other reefs where pH is naturally low, they found increased bioerosion was the only shared common feature. ‘Our study revealed increased bioerosion to be the only consistent community response, as other signs of ecosystem health varied at different locations,’ Barkley says. There are several sites around the world where CO2 is released by undersea volcanic activity that vents up from the seafloor through the base of the reefs, creating a much lower pH environment than is currently found in the open ocean. These ‘natural’ laboratories are giving scientists a rare opportunity to examine what is already happening to corals dealing with lower pH levels predicted for the future. 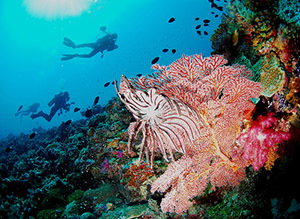 One example is a coral reef system located among the volcanic islands of Papua New Guinea. Here, streams of gas bubbles rise up from the seafloor, lowering the pH of the overlying seawater. Similar low pH conditions are found at vent sites off Japan, freshwater seeps in Mexico, and upwelling areas in regions of the eastern tropical Pacific Ocean. In collaboration with the Palau International Coral Reef Center, members of Cohen’s lab have been conducting fieldwork there since 2011. The research team collected water and coral skeletal core samples from eight sites across the Palau reef system, and deployed pH, light, salinity and flow sensors to characterize the seawater environment in which the corals grew. The research team also collected and analyzed data on the community composition as well. The skeletal cores were scanned at the Computerized Scanning and Imaging Facility at WHOI. The Computerized Axial Tomography technology generates a 3-D image of the cores, revealing detailed information not visible to the naked eye, including coral growth rates, skeletal densities and the extent of bioerosion. Using an automated program written in Matlab, the team used the 3-D images to quantify the proportion of the coral skeletons that had been eroded by organisms, and the severity of bioerosion of each coral. As the pH of the reef seawater drops, more frequent and severe bioerosion scars were revealed in the coral scans. ‘We see coral skeletons that are eaten up and have holes on the top and sides. The coral almost looks like Swiss cheese because of the volume that’s been removed,’ says Barkley. Barkley and her colleagues found bioerosion rates in Palau corals increased eleven-fold as pH decreased from the barrier reefs to the Rock Island bays. When comparing those results to other low pH reef sites, a definite pattern emerged. ‘All of these naturally low pH sites that Hannah compared are different from one another in terms of physical setting, ecological connectivity, frequencies of variability and so on. What she discovered is that the only common and consistent response to -across all these sites is significantly increased bioerosion,’ says Cohen. A previous study published January 2015 in the journal Geology by Thomas DeCarlo, a member of Cohen’s lab and a co-author on this paper, showed that the influence of pH on bioerosion is exacerbated by high levels of nutrients. That finding implies that local management strategies, such as controlling runoff from land, can help to slow the impact of ocean acidification on coral reef decline. Increased runoff from areas of intense agriculture and coastal development often carries high levels of nutrients that will interact with decreasing pH to accelerate coral reef decline. Though coral reefs cover less than one percent of the ocean, these diverse ecosystems are home to at least a quarter of all marine life. In addition to sustaining fisheries that feed hundreds of millions of people around the world, coral reefs protect thousands of acres of coastline from waves, storms, and tsunamis. Photos of Palau thanks to Tropical Beach Getaways. Yes they might survive; much as they have done for the last 180 million years with temperatures 5℃ up or down, and carbon dioxide levels between 170 and 2600 ppm. The easiest way to kill a reef is through exposure. The Great Barrier Reef has been killed many times in the past and always regenerated. This also includes the exposure of the area some 20,000 years ago during the glacial maximum when almost all reef was dead. The other way is through asteroid impacts, the end of the Permian was the end of 90% species including disappearance of limestones for a few million years. Now they are telling us that we are killing reefs through fertilisers, shipping, coal transport, sea level rise, temperature increase, acidification, overfishing, tourism, and yet the reef has never been better with local and sporadic bleaching not related to any of the above. The Palau archipelago is riddled with sunken IIWW Japanese and American tankers that are slowly seeping and everyone is expecting for oil tanks to burst soon. Imagine the outcry of the green blob, no doubt it will be blamed on glob warming crap. Jo’s misrepresentation of the science is what’s astonishing : she’s trying to spin “bioerosion escalates in Palau’s low-pH waters” into a golden age of burgeonng biodiversity. Just read the paper !. I read the paper. I don’t see its significance described above or below your post. I find it interesting what the media ends up reporting. It looks to me to be an important paper within its particular discipline and required a big effort (money to get data, coordinating cross discipline teams etc) with a very large amount of data and multiple publications as output, but is unremarkable in many ways with regards to newsworthiness. That is many press releases from research establishments are churned out daily about worthy newly published science and a huge percentage are ignorned. Why did this one get reported? And to everyone above and below – CO2 levels from millions of years ago have nothing to do with predicting the adaptability of a particular species in a particular location today. Nothing. Look for the word “fish” below for a simple question to answer. That particular statement is opinion, not data. The data is open to less pessimistic interpretations. The data of the report plus the additional evidence adduced by Joanne makes the opinion look more like a begrudging admission in the midst of a pathetic obeisance to disproven hypotheses, rather than a fair representation of the research. The finding is contrary to (their) expectation. But that expectation was founded upon a false assumption of a prior steady state condition. But nature doesn’t work like that. Temperature and alkalinity alike jitter chaotically, over periods much shorter than those impacted by human effects. The signal is less than the noise. Olivia Judson had some magnificent work on changing adaptations of Galapagos Finches, http://old.richarddawkins.net/articles/2892-a-natural-selection that documents ongoing chaos and adaptation contrary to the environmental steady state theory. That the same applies to corals and reefs is an easy inference to draw. I had presumed Timboss was being sarcastic. Now, I am not so sure. No, really I am honestly thrilled that a small percentage might survive. That is really what climate change is about – at least something will survive, as it has done for billions of years through countless temperature changes in the past. As long as they have plenty of sunlight, they’ll do just fine. Isn’t it fun to listen to the coral fizz as the pH heads south ? Nver mind the staghorn- lower ph means fewer sea urchins to step on , and less grazing pressure on our friends , the macroalgae. For normal science, when a prediction fails to occur, it is assumed that there is a flaw in the hypothesis. See Richard Feynman on the scientific method. For post-normal, evidence deprecated, hypothesis protected, politically and financially co-opted science – not so much. Well what do you expect? They’ve been chanting “The Science is settled!”; only to find science is never settled because we don’t know everything about anything yet. We’re still discovering the environment around us. Heck, my sister is studying dentistry (core courses overlap with Medicine degree) and they pretty much tell her we haven’t even worked out everything about our own bodies! There are many mysteries yet to be explored. The problem is when certain political groups have already come to conclusions and try to mould science to support their agenda. They conduct emotional bullying on anyone who doesn’t agree with them…Then its somehow a surprise when Nature shows a different story! Science => We don’t know everything. Let’s see what the World tells us. Let us study its wonders. Politicised Science => We know everything there is to know. Listen to us! Trust us! Believe us! Our predictions will come true! Besides, Politicised Science doesn’t work with Engineering. Engineering requires that we understand in order to solve problems of the real world. You can’t build a bridge with politics! In fact, Politicised Science would produce solutions based on Design by Committee principles; as it will favour “Consensus” as its priorities…And we all know how these Design by Committee projects turn out! Unfocused and doesn’t solve the problem! Some engineering humour => A camel is a horse designed by committee. I have never understood this. Camels function very well. Agreed Leonard – definitely part of the MO. and not more mundane things such as nutient run-off and the Crown of Thorn starfish. The evidence for man-made climate change, i.e., global warming, is spurious as the more accurate unhomogenised satellite temperature measurements, including the oceans, hasn’t shown any significant warming for 18 years or so, and the chemistry of carbon dioxide is such that tropical waters tend to vent this gas and colder waters absorb it, so I cannot see why it is going to increase very much where there are coral reefs. With pictures of CO2 vents directly in flourishing Coral Reefs. The Greens Love Fake Scares and Real Dollars. Your comment reminds me of the real, as opposed to alarmist-think, reason for threats to polar bear populations, which is a cold late Spring that adversely affects the number of seal pups available as a primary food source. Nutrient runoff and Crown of Thorns starfish are the real threats to the Great Barrier Reef, as are late cold Springs to the polar bear, but those are not emotive enough subjects to incentivise the gullible to open their wallets to the predatory activist groups like Greenpeace and Friends of the Earth. The reality is coral reefs have been around for hundreds of millions of years adapting to huge changes in CO2 levels and temperature, just as they do today on a lesser scale on a weekly or monthly basis. I’m hoping someone will help with the two questions in your last paragraph and maybe also a third from me, that is, what atmospheric co2 levels will be needed in order to achieve 150% increase in ocean acidity by the end of this century. A politician who talks in percentages is probably lying. A politician who always talks in percentages is always lying. Actually, the concept of pH was not even introduced until the early 1900′s. Not sure where the measurements come from attributed to the Industrial Revolution, but it must have been inferred from other chemical analyses. Or (shall I dare say it), from models. And the 30%? It is because pH is a log (to the base 10) measurement of acidity. Specifically, pH = -log[H+], where [H+] is the hydrogen ion concentration in moles/L. Take -0.1 as a power of 10 on your calculator and it will give you 0.794, a change of 0.306 or 30%. Yet the irony is that warmer waters seems to have a higher pH than colder. I thought every one knew that CO2 and SO2 are more soluble in cold water. Also the cold water closer to the bottom of the oceans has a lower pH than the warm water close to the surface near the equator. Cold water up welling near the pacific coast of Mexico has been measured to have a pH around 7.6 while water near the surface close to Pacific islands such as Tahiti have been measured to have a pH around 8.1. There is general a lack of pH measurement data. I believe that measurements are being attempted by the Argo buoys but as far as I know no data has been published. It is just nonsense to say with the sparse data available and the range of pH around the world that the pH has declined. Sure! For your die-hard catastrophist this is hard reality breaking news- not that will filter through.Life goes on and we’re a little speck in the line of time. The unethical posturing of Greenpeace and other alarmist elements who tried to mislead gullible bureaucrats and politicians about a “parlous” state of the Great Barrier Reef in the lead-up to the recent UNESCO meeting has caused them to suffer serious credibility damage. The Australian tourism industry has recorded a drop in international visits to this splendid natural wonder. Reportedly, would-be tourists have the perception that the GBR is dying and is but a shadow of its former self. Tourist operators who have an understandable interest in seeing the GBR remain in healthy state are livid by the misleading hype and beat-up by alarmists. Fortunately some academic realism is now emerging that shows the GBR is far less threatened by human activities than it is by cyclic destructive natural forces, especially tropical cyclones. This Palau study reported by Jo adds to a much needed awareness of the adaptability of complex coral systems. Climate alarmism is having a bad 2015, just when it is trying to crank up its hype before the IPPC talkfest in Paris in December. Not before time! I think that Paris is about due for a massive cold snap this December (remember Copenhagen in 2009?). If we go back to the geological record the Late Devonian coral reefs in the Canning Basin were flourishing in a time of much higher atmospheric carbon dioxide levels than today. I wonder if any of those so called ocean Ph researchers have ever read any of this NOAA stuff on ocean Ph measurements before “being surprised” and making their claims. Since the beginning of the Industrial Revolution, ocean pH has fallen by 0.1 pH units, which represents an increase in acidity of approximately 30 percent. For marine life that has evolved over millions of years in relatively stable pH conditions, this kind of rapid change doesn’t allow for much time to adapt. While seawater pH measurements have been made on some oceanographic expeditions starting with the first measurements that were made by Sørensen and Palitzsch (1910), most of the earlier data have proven to be problematic for a number of reasons that we will describe below. In addition, there is the added problem of data sparseness in any given year for the earlier data sets, which makes the determination of a global annual mean value for a particular time period to be quite challenging, necessarily increasing its likely uncertainty. During the period from 1910 thru 1988 the most common method for measuring pH was the potentiometric method using hydrogen ion sensitive glass electrodes coupled with a reference electrode (Dickson, 1993a). This method suffers from a number of measurement and calibration issues (i.e., temperature of measurement and conversion to in situ temperature, calibration for use in a high ionic strength medium, glass electrode drift, reference electrode drift, and liquid junction potential issues) that have led to significant measurement uncertainties that are difficult to quantify adequately. In recent years the spectrophotometric pH method described by Byrne and Breland (1989) has been shown to be about one order of magnitude more precise. Its accuracy has been improved over the years since then. Over the years, pH has been expressed on one of four different scales: (1) the total hydrogen scale, [H+]T; (2) the free hydrogen scale [H+]F, (3) the seawater scale, [H+]SW, and (4) the NBS scale aH(NBS) (Dickson, 1984; Zeebe and Wolf-Gladrow, 2007). The differences in the respective pH values can be significant. For example, for a seawater condition of salinity = 35 and temperature = 25°C the difference between pHT and pHNBS is greater than 0.1. The exact difference cannot be determined easily as it is, to some extent, dependent on the exact design of the liquid junction used in the potentiometric pH cell. Unfortunately, a large number of the earlier data sets submitted to the National Ocean Data Center does not include any information indicating how pH was calibrated (and thus the pH scale being used). All of the earlier (before 1975) glass electrode measurements (and many more recent ones) were calibrated against NBS style buffers with an ionic strength of 0.1 mol kg–1. The liquid junction potential of the pH cell is sensitive to ionic strength and to the composition of the solution it is in, so moving the electrodes from these low ionic strength buffers to the higher ionic strength of seawater (0.72 mol kg–1) makes apparent pH readings drift for a period of time. Furthermore, different electrode designs can result in differing pH readings (Dickson, 1984). This problem can be largely eliminated by calibrating the pH cell against standard buffer solutions such as 2-amino-2-methyl-1,3-propanediol (Tris) in synthetic seawater (DelValls and Dickson, 1998; Nemzer and Dickson 2005). When these procedures are followed carefully, the uncertainty of a potentiometric measurement of seawater pH (expressed total hydrogen ion conentration) can be less than 0.02. The problem is that this approach was not implemented routinely until the 1990s (Dickson, 1993a,b; Dickson et al., 2007). Whether measured on a ship or back in a shore-based laboratory, pH results have to be corrected back to the in situ temperature at which the samples were originally collected to provide an estimate of the in situ pH. If the difference between the temperature of measurement (usually around room temperature) and the in situ temperature is more than 7 degrees Centigrade, these corrections can be quite large (>0.1 pH units). Unfortunately, much of the supporting metadata (records of the measurement temperature, the in situ temperature and the mathematical formula for conversion of the data from one temperature to the other) was not given to NODC along with the data files (Boyer et al., 2013). Hence, in many cases, we are not certain what pH value is being reported (measured versus in situ). We suspect that a significant fraction of the historical pH values were reported at laboratory temperature and were never corrected back to the in situ temperature. In many cases, the measurement temperature was not reported as part of the metadata package, making later temperature correction impossible (Boyer et al., 2013). The lack of information as to whether the pH values were reported as measured versus in situ, and the lack of documentation on measurement temperature will lead to large pH uncertainties in the earlier database. Nobody is sure what the ocean Ph actually was only a couple of decades ago which hasn’t stopped them one bit from making another huge scare story based on nothing more than some assumed ocean Ph levels. a mirror image of the severe problems in assessing global temperatures. With almost exactly the same solutions. “Since the beginning of the Industrial Revolution, ocean pH has fallen by 0.1 pH units” ??????? How do they know? pH meters weren’t in use before 1910 yet they claim to know the pH back in the 1740′s. How? Well they used a computer model. First they assumed that the pH of sea water depended on the CO2 concentration, then they assumed that the CO2 concentration was ? , so the model came up with that answer. Not a single fact was harmed, or even seen, during this beat-up. The Wendy Schmidt Ocean Health XPRIZE is a $2 million global competition that challenges teams of engineers, scientists and innovators from all over the world to create pH sensor technology that will affordably, accurately and efficiently measure ocean chemistry from its shallowest waters… to its deepest depths. A. $1,000,000 Accuracy award – Performance focused ($750,000 First Place, $250,000 Second Place): To the teams that navigate the entire competition to produce the most accurate, stable and precise pH sensors under a variety of tests. B. $1,000,000 Affordability award – Cost and Use focused ($750,000 First Place, $250,000 Second Place): To the teams that produce the least expensive, easy-to-use, accurate, stable, and precise pH sensors under a variety of tests. Our oceans are currently in the midst of a silent crisis. Rising levels of atmospheric carbon are resulting in higher levels of acidity. The potential biological, ecological, biogeochemical and societal implications are staggering. The absorption of human CO2 emissions is already having a profound impact on ocean chemistry, impacting the health of shellfish, fisheries, coral reefs, other ecosystems and our very survival. A better pH meter? Yes, a good idea, but my BS meter is giving very high readings. Spot the management-speak! If it comes from California don’t even read it. Your BS meter is working perfectly. Can anyone confirm the pH units between say pH8 (alkaline) and pH6 (acid) is 100 units? If so, how can a 0.1 change in pH amount to 30% increase in acidity? Richard it is a log scale. So the difference from pH 7 to 8 is a factor of 10. True Jo, but I still don’t see how that permits a “30%” answer??? So a Ph of 7 has 1/10th of the H+ of a Ph of 6. Specifically if the change in the logarithm is 0.1, the change in the ratio is 10^0.1 or 1.27x so 27%. If you want to check this, increase something by 27% ten times. 1.27^10. You will get your 10x. Richard111: whenever pH is mentioned, there’s a rather important minus sign which is by convention omitted for convenience, and this causes confusion among many. For example, a pH of 7 means that a solution contains 10 to the minus 7 (10-7) grams of hydrogen (in the form of hydrogen ions) per litre. Translating this into a number, it means that our solution contains 0.0000001 (that is, 1/10,000,000) grams of hydrogen per litre. A solution of pH6 contains 0.000001 (1/1,000,000) grams of hydrogen per litre, and one of pH8 has 0.00000001 (1/100,000,000) grams of hydrogen per litre. A solution of pH7 contains 10 times as much hydrogen as a solution pf pH8. Hence, pH decreases as hydrogen concentration increases. As you can see, things get a little awkward when you’re talking about for example hydrogen ion changes from 7.9 to 7.7. How to calculate the hydrogen concentration from these? What you need the negative antilog calculator function on your pocket calculator. Here are two examples: a value for a pH of 8.3 would be typed in as -8.3. The antilog value will emerge as 5.0119 X 10-9 (5.0119 times ten to the minus 9), and this is the hydrogen ion concentration. For a pH of 8.2, type in -8.2. The answer will be 6.3095 X 10-9. The difference between 5.0119 and 6.3095 is 25.89%, which is for argument’s sake 26%. In other words, the difference in 0.1 of a pH unit between 8.2 and 8.3 is 26%. I think that 30% is rounding things off a little too far, but for propaganda purposes it’s ideal! Carbon500, that is an impressive explanation. I feel I almost understand how it works. Many thanks for your time and I’m off to push buttons on my calculator to convince myself I do understand it. The 27% representing 0.1units is a typical unit selection based misinformation. The scale is logarithmic for a reason. 0.2 units is not 54% and 1 unit is not 270%. I wonder what is it in ppbs? There was a decline in acidity during the LIA, not exactly sure why. Theoretically warm oceans should see a decrease in acidification because of out-gassing, whereas cooler oceans would dissolve more CO2 and create acidification. This will require further research. Just my SWAG – How about that during the LIA there was greater ice coverage over the areas of ocean that were below the threshold of absorbing CO2? The tropical regions were still warm enough to outgas, leading to a net average reduction of CO2 concentration with an attendant rise in pH. The ice coverage during the LIA wasn’t all that large, but at the Last Glacial Maximum we can see the mechanism in pristine purity. Oh, so we had satellites to measure Arctic sea ice during the LIA? Earlier today Warwick Hughes’ blog had links to a series of youtube displays of “Daft junk maps from the Australian Bureau of Meteorology” by sliggy. The Hughes blog is now offline for some unknown reason. Their global warming [snip] is falling apart on all fronts. Still they insist it’s only a “flesh wound” and refuse to relinquish the teat. Rather they continue to ask for more because they haven’t a clue. Surely this means “It’s worse than we’d hoped for”? I don’t know, maybe they were hoping for boiling acidic oceans that dissolved ships, but it was not to be. Hardy beasts those coral reefs. There are 2 things that will kill them off – not by Homo Sapiens but by natural geological events events. 1. Eustatic SL fall and associated clastic input. Clastic input will kill the reef stone dead. Minimal clastic input and the reef will survive by back stepping as the shoreline retreats (progradation). This is what you would expect during an Ice Age or rapid fall in eustatic SL, of which there have been many in recent geological time. 2. Rapid SL rise where the “reef build up” cannot keep up with the eustatic SL rise, ie the reef is drowned. This mainly applies to isolated pinnacle reefs e.g the Maldives where retrogradation is not possible. Now with reefs close to the shoreline then the reef will survive by retrograding as the shoreline moves inland. Clastic input will not be an issue here during these periods of “SL Highstand”. All very simple but try and explain this to the “Greenies” and you will be met with a blank stare. Don’t these climatologists know anything about paleoclimates? In the Paleocene (prior to the Miocene) CO2 levels were as high or higher than 1000 ppm. Modern corals evolved when the CO2 level was much higher than today. Which is why, as CO2 continues to increase, modern corals will do quite well. It seems that these scientists do not know much about evolution or paleoclimatology or historical geology. One wonders how they are qualified to study corals? This presupposes a natural sense of curiosity and a real enthusiasm for scientific truth, Frederick. Qualities which I suspect are lacking in a lot of the bozos reporting today’s climate-related research. Also in 1954 the American Government exploded a big H-bomb on Bikini Atoll. At 15 megatons, the blast vaporized 3 islands but 61 years later the coral keeps growing back — unlike the humans that have suffered badly from the effects of that bomb. Now who said coral was fragile? I thought some of this lot would be used to being ‘astonished’ at how that great big gorgeous woman, Gaia gives the bird to alarmists who start telling her what is what. Get used to it alarmists and be careful if you really piss her off. It might be embarrassing. These are piffling numbers. A Ph of 7 is pure water, neither acidic nor alkali. It is stuff you would love to drink. Lemonade however can be Ph 2.5 especially Coke. So it has 10^4.5 or 31,000x more acidic and while not recommended for swimming or storing old metal is fine when it hits your stomach with a pH of 1.5 to 3.5, hydrochloric. So roughly the oceans vary between entirely fresh water (apart from salt) at 7.0 and very slightly alkaline at say 8.3. Where is the worry? It is also a buffered solution with trillions of tons of calcium carbonate to be eaten before the coral. It is hard to believe, but the Great Pyramids of Giza, whole cities like Paris and London and Odessa and the White Cliffs of Dover are just old sea shells, calcium carbonate. Whole countries are built on coral atolls, kilometers deep. Yes, Carbonate. Carbon. It is an element, not a poison. All life on earth is made 90% from Carbon, hydrogen and oxygen. Without Carbon we do not exist. So of course the seas are claimed to be acidic when they are not and carbon is supposed to be pollution, which means all life on earth is pollution. This is absolute science nonsense promulgated and pushed by complete ignoramuses who pretend to have some understanding of science. Greenpeace even banned Chlorine! You cannot ban the periodic table. There is nothing wrong. The world is fine. Burn all the old leaves you like. It is all natural and of no consequence. Man does not control his universe or CO2 levels. He certainly does not control the UN. However they want to control you. Calling a drop from alkali 8.3 to say alkali 7.8 is not acidification. Acid is acid, not alkali. That is a deliberate and deceitful semantic game like saying reduced savings is the same as debt. You are either in debt or you are not. Also it is denying every physical chemistry concept of a buffered solution. The whole world and so much of the geology is based on an alkali ocean. You cannot change it with the addition of a tiny amount of CO2. 98% of all the world’s CO2 is already in the ocean anyway! What is does tell you is that the intention to deceive is strong. That real scientists would be party to this shows how important this blatant deceit is to them. When someone talks acidification, just ask if that is the same as acid. The oceans are alkali. “Coke” is reputedly OK for cleaning up metal as a soldering flux if you do don’t have anything else on hand. And you can always drink the rest of the”solder flux” if you get thirsty! I’ve also used it to help shift (worn out) bearings frozen onto a shaft which resisted (and bent) a huge puller. Both parts being steel, had almost identical coefficients of expansion and rates of heat conduction, so heating was not useful. Also – like saying that reduced taxation is a subsidy. Oh dear, therein lies the problem that there are only a small percentage of the population that really understand much about science, and there are also some who do, but are adherents to the global warming hypothesis such as the authors of this paper. In the current parliament of 150 there appears to be only a couple of scientists and engineers drowned out in a sea of lawyers, ex-unionists and former party staffers. Former PM Rudd took an entourage of a 100 odd advisors to the Copenhagen conference: one wonders how many sceptics were among them, and how many of them are currently advising Minister Hunt and will be at the Paris conference with him in November? I appreciate it, being an ill-educated lout. I second that FijiDave, me too. But it was us lot elected the bozos who claim we are pollution personified. Edge of the Philippine Plate on the ring of fire, 300 of the islands are volcanic, rainfall 3800mm p.a. and the reef is pristine. The only astonishing thing is they managed to score a four-year study of what should have been bleedin’ obvious. Is that grinding sound that of reefs crumbling, the teeth of the frustrated alarmists – or the sound of data being adjusted (too late!)? I have always thought coral reefs were a very odd choice for a climate alarmist poster child since the biggest constraint on coral extent and growth is temperature. Coral is one thing almost guaranteed to thrive in a warmer world. Buy some cool carbonic acid (aka carbonated water) and have a nice drink of it. Or make your own with the 1970s favorite of SodaStream or Soda Maxx, with water that is chilled, optimally to just above freezing, in order to permit the maximum amount of carbon dioxide to dissolve in it. If you get it correct the water is slightly tart flavor. The pH level between 3 to 4! Yes that’s how ‘acid’ it can get, you can only put so much CO2 into the water for a certain temperature. Here’s a whole heap of not that helpful info about carbonated water HERE but I would ask you to think of it slightly differently. As CO2 dissolves in the vast oceans the acidity would try to increase. These oceans however are full of salts of metals that are base (the opposite of acids) so overall oceans are slightly alkaline. These metallic ions are free to react with the carbonic acid molecules forming (often insoluble) carbonates, and (soluble) bicarbonates. It is possible to get either carbonate or bicarbonate when passing carbon dioxide into alkaline solutions. Usually carbonates are formed when small amounts of carbon dioxide are passed through alkaline solutions. But bicarbonates are more often formed when excess of carbon dioxide is passed into the solution. The solution stays alkaline up to the point that all the metal ions have reacted to become dissolved bicarbonates. and carbonic acid ions are the majority ion in seawater. Also understand that the oceans have truly vast stores of calcium, magnesium, iron, zinc and barium, these are all very reactive metals and will react to possible changes in pH quite quickly — buffering the action of the CO2 dilute by reacting with it. This buffering action means that rapid pH changes to the oceans is resisted mightily for a very protracted period of time — maybe as long as decades, or centuries for the volumes of dissolved CO2 being considered. Also be aware that millions of tons more metallic ions are being wash from land to the oceans by the sustained action of erosion every year, ensuring that ocean acidification is a seriously slow process. Everybody or at least I assume most know that what we call coral, as in the hard bits, is the carbonate substrate created by colonies of cloned coral polyps with their symbiotic zooxanthellae, the photosynthesizing algae that the coral provides protection too and the zooxanthellae in return provides food for the coral polyp. The process by which the coral polyps create coral is not entirely known but the usual enthusiasts that you will find in just about every aspect of Nature that can be locked up, caged, put in a tank with or without water and etc are also to be found raising coral polyps and creating miniature reefs in their coral reef aquariums. And in the usual enthusiast fashion they probably know as much as the experts on the subject. So here is an article from the Advanced Aquarist on the way in which the coral species, each species with their uncountable numbers of identical cloned tiny coral polys take the ocean chemicals and elements and turn them into that hard carbonate rock which we call coral reefs. So many things happen in living organisms that are not well understood that a very long list could be written. I’m plagued by something that medicine doesn’t understand, is completely harmless as far as health effects but a total nightmare if the symptoms are not treated. And that’s all I can get, something that stops the symptoms, not the cause. The failing mechanism is known but how to prevent it from failing isn’t. And I wish it was as simple for me as understanding the chemical equations seems to be for the coral building. Now that we know the reef is doing well, can we get the research redirected toward human physiology and human problems? Probably not. Instead we’ll get more efforts to save a planet that doesn’t need saving. Nice one tom0mason. Big thanks. “Google Street View has partnered with scientists to create 360-degree panoramas of the world’s coral reefs, called Google Street View Oceans. New ocean sites continue to be added to the project, which was released in 2012. The science team hopes to develop a rigorous system for monitoring the coral’s health while giving the public a chance to explore these beautiful but vulnerable ecosystems. Maybe google avoid photos of the 50% death & destruction wrought by the evil carbon(sic) compound? Some visiting American scientists very recently blogged about their trip to the GBR. “MAYBE I SHOULD SPEND A SEMESTER AS A VISITING PROFESSOR IN AUSTRALIA: At least, reading this blog makes me think so. missing link re: Ove Hoegh-Guldberg quote. It’s as cold as charity on the shores of Moreton Bay Qld tonight. My litmus paper continues to refuse to change colour. It is like an ill disciplined child!!!! Hm. A “pause”, or “hiatus”, in coral deaths? I suggest going back and “adjusting” the data. So a group of polyps that evolved 450 million years ago when CO2 was 2000 PPM of the atmosphere and survived times when CO2 was 4000 PPM of the atmosphere are thriving when CO2 increases to 400 PPM from 300 PPM. I tell you I am dumbstruck! Flabbergasted, cannot believe it! The corals display a grand show. Maybe if they had not started with the preconceived idea that they would find dieing coral they could have avoided being astonished??? I don’t know what’s going on and I want to find out. That would astonish me. That would be someone to keep around and well worth paying for too. It was Australian researchers who piblished the Milne Bay, PNG coral studies. The ‘pH’ damaged reef was actually damaged by toxic hydrogen sulfide. Amounts to academic misconduct. Wrote up yhe details in essay Shell Games in my ebook. Good to see that in uncontaminated waters, the reefs thrive at naturally lower pH. Chemistry graduate students get their hands smacked for repeatedly recording pH changes as “%” changes. It is a sign of failure to properly understand the basic nature of a logarithmic scale. When there’s a legally binding ethic established and enforced. They are a bunch of fruit cake nuts, there is a 1,000,000 dollar reward for the person who can come up with a machine that can monitor the PH of the seas accurately. The Ph of the seas varies from 7.5 – 8.5 and around coastlines is even more varied. At Bikini Atoll the coral was vaporized back in the early 1990s by nuclear bomb, the seas reached 50,000 degrees in the area, three islands were vaporized. The coral has now grown back like a forest and is in pristine condition. Coral was devastated on islands in the Pacific, in the 1970s onwards, from the increase in tourism , the coral was used in construction. On the Maldives, back in the early 1990s, it was estimated that had this continued the coral would have disappeared in 30 years. A ban was put on the use of. The more acidic(less alkaline) the water is, the more calcium is available for the corals, so the effect could be the reverse of what is postulated. nonsense. Ask yourself- Do I understand simple chemical reactions? Do I understand cell membrane physiology? Do I think before I write? And based on WHAT does such a conclusion come from? Why their religious belief in that they know what is right and proper, not from scientific fact. It may very well be thriving Because of the changes, but there is no way that they can accept that AND their own belief set. They forgot Einstein’s statement – it only takes one thing disproving the theory to prove it isn’t correct, and the fact that this reef flies in the face of their theory proves their theory to be based improperly. Instead, they will attempt to find some way to “fit it in” without changing their basic beliefs. I’m still trying to make sense of the comment in the opening paragraph of the press release, saying that dissolving CO2 in water leads to a decrease in carbonate ion concentration. Do these people even know what a carbonate ion is? I even wonder if they know what a coral is. They appear to always concentrate on the polyps, conveniently forgetting the sybiotic algae. As the pH decreases (CO2 concentration increases) more CO2 is available for the algae to produce food for the polyp which grows more strongly and is better able to protect its carbonate shells from the acid effect of higher CO2 concentration. There have been far too many examples of poor reasoning and experiment design (usually because of the assumption that e.g. acid is acid) to confirm the predetermined result to accentuate the “Climate Change Is Destroying The World” narrative. Sheesh… tell me about it. (about 17 mins in) Barclay THINKS he heard on the news “this morning” The Great Barrier Reef won’t be put on the in-danger list (laughter from audience/guest!). the interview was done 29 May interview, the day of UNESCO’s announcement, so Barclay either KNEW it had been announced, or should have known, given his feigned concern for such environmental matters. CSIRO’s Hajkowisz: it’s badly up the creek without a paddle, if u ask me. goes on to enumerate all its problems(?) – we’ve lost half of it, star fish, coral bleaching, etc. The CSIRO’s, Stefan Hajkowisz believes there are seven Mega trends determining our future. He discusses them with Paul Barclay. Barclay: China will construct two cities the size of London every year for the next 20 years. Hajkowisz: rapid economic growth in Asia – puts the world economy in Australia’s back yard. this is an incredible opportunity to respond to a massive market of 1 billion-plus people getting wealthy, wanting superannuation, health care, & tourism & holidays. nonetheless, CAGW, renewables, the latest Tesla batteries, & moving to a new “experiential” consumption is discussed, as if it made a difference to the climate or something. Barclay sees his taxpayer-subsidised(?) solar panels as an example of this new consumption model and offers “ethical investing” as another. lol. Good to see my old friends the mollusks (did my M.Sc. on Devonian mollusks) are doing well on this lower pH reef. If lower pH is expected to effect coral then it should also be retarding the growth of mollusks. As it’s not then we have at least 2 groups, corals and mollusks, that are defying the expectations of the “experts”. I think someone might be able to do a PhD thesis on the effects of low pH on living calcium carbonate secreting organisms as obviously there is something going on here that has not been studied before. Might be hard to find the backing for it though, given that the results would most likely not boost the scare mongering so popular in our universities today. “…rather it is thriving despite the low pH” Let’s play “Spot the preconception”. It’d be more fun to ask Fräulein Doktor Cohen just what is the ‘ideal’ seawater chemistry for a particular organism, then ask her if that’s exactly the same ideal condition for the next critter down the reef. I admit – I really enjoy watching people stammer. One will note that hard corals first appear in the fossil record when global CO2 levels were about 5x today’s levels. They do fine in a higher CO2 environment — they were raised on it. what bs. Following this idea, since we (humans) are evolved from creatures that lived at these times and during periods where oxygen in the atmosphere was almost zero we should do just fine with no oxygen. Here is a thought. There are fresh water fish that evolved from oceanic fish in the last million years. How do you think they would fare if you made their lakes and rivers more saline? The coral from millions of years ago is not the coral you see today. Stop pretending that you understand evolution. Oxygen was highest during the Carboniferous period thanks to the explosion of plant life but at no time was it “almost zero”. Today’s level looks to be only slightly below average for the last 400 million years and the lowest was about 25% less than today for a relatively brief period. The FACT that commercial greenhouses use 4X elevated CO2 to grow better crops destroys your argument that plant genetics today do not have any resemblance to plant genetics 100′s of millions of years ago. If that’s for true for plants then why not animals? Sorry Mike but atmospheric O2 levels were well below that breathable by humans for most of evolutionary time, including close to zero for much of that period. Your last and second last paragraph destroys no argument that I made. You just made something up and attributed it to me. Lovely straw man. I’d be interested in your comments on the fish question I asked. Also be interested in your thoughts on why are there different coral communities in different parts of the world. I am asking this assuming for the moment that you have some grasp of population and evolutionary biology. I am always facinated by the MSM play on words – ‘More acidic’? Shouldn’t it be ‘Less alkaline’? After all it is still alkaline, and won’t begin to become acidic until it gets below 7.0pH. Just as warming the planet a little and supplying more CO2 to plants are both better conditions for life, reducing the alkalinity of the ocean would be also be expected to be a better condition. The significance of this paper is not what it shows about coral reefs but what it shows about oceanographers. They obviously think that the Green hype around “acidification” has some sort of scientific value. To them, what the tabloids have been saying is on an equal footing with the actual data. If one of them has to be wrong, they are half inclined to think it’s the data, rather than the tabloids. I’m not at all surprised to find that some coral reefs are not much affected by (slight) pH changes. It doesn’t mean that there is no effect. It just means that the hype is only hype, and can’t compete with the complex and detailed nature of reality.